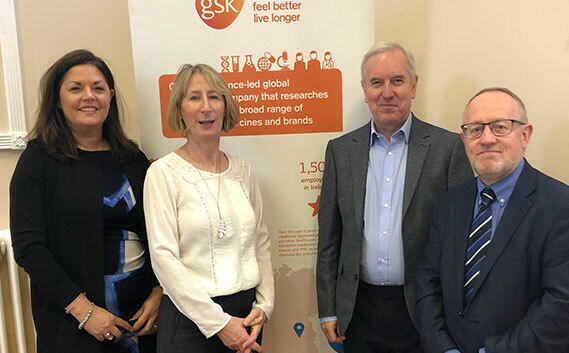 Helen O’Dwyer, GSK, Rosemarie Carroll, HMI, speaker Brendan Schutte and Seamus Gallagher, Secretary HMI West at the Merlin Park meeting of HMI West. Workplace mediation was a process in which an impartial third party assisted those in conflict to reach their own resolution for solving their differences, Mr. Brendan Schutte, Workplace Mediator, told a meeting of HMI in Galway in February. Maureen Browne reports. Mr. Schutte has mediated in numerous two-party and multi-party workplace situations and is one of the most experienced workplace mediators in Ireland and the UK. Much of this work has been in hospitals, emergency services, health research, pharmacy/pharmaceuticals, and general medical practice. He is author of “Fixing the Fighting” (Oak Tree Press, 2005), an audio CD entitled “Active Listening” (2014), an ebook “The Essentials of Workplace Investigation” (Bookboon, 2015) and numerous articles. He said the characteristics of workplace mediation were that it was respectful, future focused, listened to how people felt and what they needed, was realistic, confidential, informal, effective and voluntary. It had a number of advantages, compared to an investigation or a legal approach, as it facilitated self-determination, had an impartial mediator and was a fast focussed intervention at a reasonable cost. Broadly speaking, interactive mediation asked the parties to reflect, exchange and move on. Mr. Schutte said that workplace mediation should be used more than it was at present. It was particularly helpful in bullying/harassment/sexual harassment claims, grievances, performance management and difficult conversations that needed help. It was also valuable after investigations, in order to improve work relationships, where there were “personality clashes” and in change management. But the potential was there for further use in other areas as well – patient complaints, personal injury, disagreements with contractors and suppliers, the list was endless. Really, anywhere there was conflict of some kind could benefit from the use of mediation. The characteristics of workplace mediation were that it was respectful, future focused, listened to how people felt and what they needed, was realistic, confidential, informal, effective and voluntary. While there was some variation in process depending on the facilitator, most would have initial preparatory meetings with the parties separately followed by a single, or perhaps a series of, joint meetings. A key factor was to open up communication between the parties, assisting them to gain a fuller understanding of what has happened, and then focus on options and possibilities for resolution. The final stage distilled the ideas into an agreement that was acceptable to all. While a written agreement was not absolutely necessary, most people preferred to have a closure document that could be signed and addressed resolution at cognitive, emotional and behavioural levels. If nothing else was achieved at mediation there had at least been a high quality listening conversation and the parties would no doubt have learned a lot. However, the mediation process was also very successful in terms of agreement outcomes. Mr. Schutte said that while mediators were not a state regulated profession, there was an institute – the Mediators Institute of Ireland – which self regulated the profession and ensured standards remained high for members. In the past mediation had been considered as an ‘alternative dispute resolution mechanism,’ but with the coming into law in Ireland of the Mediation Act in 2018, it had moved centre stage as the best practice procedure. Fans of mediation often cited advantages such as speed, little or no risk, and perhaps cost if mediation was able to prevent a dispute heading to the courts or to other expensive, time-consuming internal processes such as investigations. He stressed that mediation was not a replacement for good management. Mr. Seamus Gallagher, Secretary HMI West thanked Mr. Schutte for a thoughtful and insightful presentation. It had, he said, been a most interesting lecture for all those who attended.